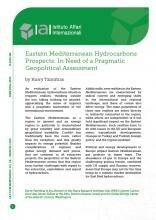 Harry Tzimitras, Eastern Mediterranean Hydrocarbons Prospects: In Need of a Pragmatic Geopolitical Assessment, IAI Commentaries, 19:18, IAI, March 2019. New realities in the Eastern Mediterranean are characterised by radical current and emerging shifts in the international and regional landscape, and these of course also affect energy. The main parameters of these new realities are either directly or indirectly connected to the region, while others are independent of it but hold significant impact on the Eastern Mediterranean. Such realities have to do with issues in the EU and European states; transatlantic developments; changes in Turkey and Turkish foreign policy; and the Cyprus problem.